GitHub - nim-lang/Aporia: IDE/Advanced text editor mainly focusing on support for the Nim programming language. Want to be notified of new releases in nim-lang/Aporia? Note: As of 2018 Aporia is considered obsolete. Most of the Nim community has switched to VS Code instead. Feel free to use Aporia, but know that it may not be maintained anymore. Aporia is an IDE for the Nim programming language. 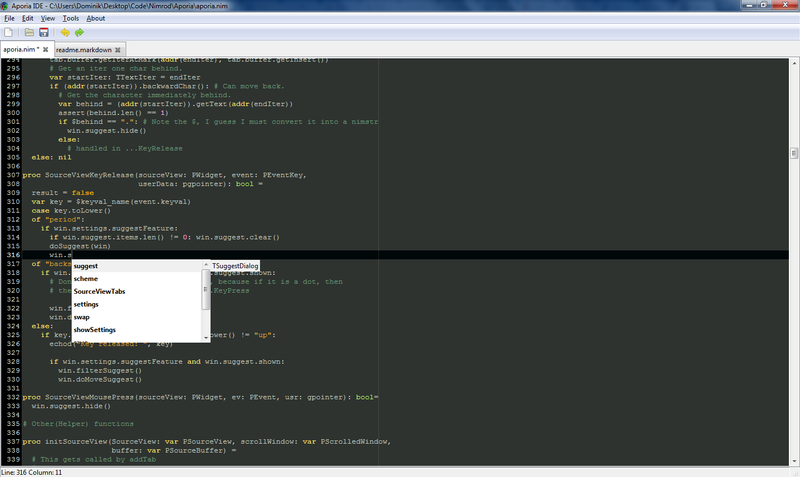 Aporia uses GTK as the default toolkit, and the gtksourceview for the text editor component. The method by which Aporia can be installed depends on your platform. The following installation instructions are valid as of version 0.4.1 of Aporia. No windows binaries available right now I'm afraid. Sorry! You can install Aporia via the Nimble package manager, take a look at the Linux/BSD installation instructions to see how this can be done. Keep in mind that you will need to also install Aporia's dependencies manually if you install Aporia this way. The dependencies are listed below under the #dependencies section. As of version 0.4.0 Aporia now offers very good Mac OS X support. The releases page contains a zipped archive to an Aporia app bundle, which you can download and begin using immediately! Some Linux/BSD distributions may package Aporia so make sure to search for it using your favourite package manager. For example, AUR offers an aporia-git package. In most cases, you will need to compile and install Aporia manually. The easiest way to do so is using Nimble. First, if you haven't already done so, install Nimble. The instructions for doing so can be found here. This will download the latest Aporia release, compile it and install it to ~/.nimble/pkgs/ and ~/.nimble/bin/aporia. You can then execute Aporia by executing ~/.nimble/bin/aporia from your terminal. You can add ~/.nimble/bin to your $PATH to make the execution easier. Then you will need to use your Linux/BSD distribution's package manager to install Aporia's dependencies. These include gtk2, gtksourceview (version 2, not 3), and pcre. More information about these can be found in the #dependencies section. To compile Aporia you need the latest version of the nim compiler, preferably the unstable release from github. Aporia sometimes relies on bug fixes which have not yet made it to a stable release. To build Aporia execute nimble build in its directory. To build and install Aporia execute nimble install in its directory. You can also quickly install it using nimble without the need to clone this repo yourself, just execute nimble install aporia@#head. Note: You also need to install some dependencies for Aporia to run. The section below explains this in more detail. Assuming that all dependencies are installed and you installed Nimble properly, you will be able to launch Aporia by executing aporia in the terminal. If you do not want to get the nim compiler you can still compile Aporia from the generated C sources, it's as simple as executing the build.sh script (or build.bat on Windows). You can then also use install.sh to install Aporia. Aporia depends on the following libraries. You may already have those installed especially if you are on Linux. Warning: If you are on a 64bit version of Windows you must not compile Aporia using a 64 bit version of Nim. This is because there are no 64 bit GTK+ binaries available, see discussion here. If you already have GTK+ on your system, you don't need to do anything. Just make sure GTK+ is in your PATH. If you don't have GTK+ installed then you need to install it. You can get the latest version from here. Make sure that the installer adds GTK+ to the PATH. The GtkSourceView doesn't have an installer, however binaries are available from here (these are 32 bit only!). Just pick the latest version and download the archive then copy the files/folders in the archive into the 'bin' directory in gtk's directory (Most likely: C:\Program Files\GTK2-Runtime\bin). The dll for this can be found in nim's repo, in the "dist" directory. Just copy it into aporia's directory or somewhere into your PATH. Use your package manager to install the dependencies (gtk2, gtksourceview and PCRE). The easiest way to get Aporia running on Mac OS X is by installing its dependencies using Homebrew. 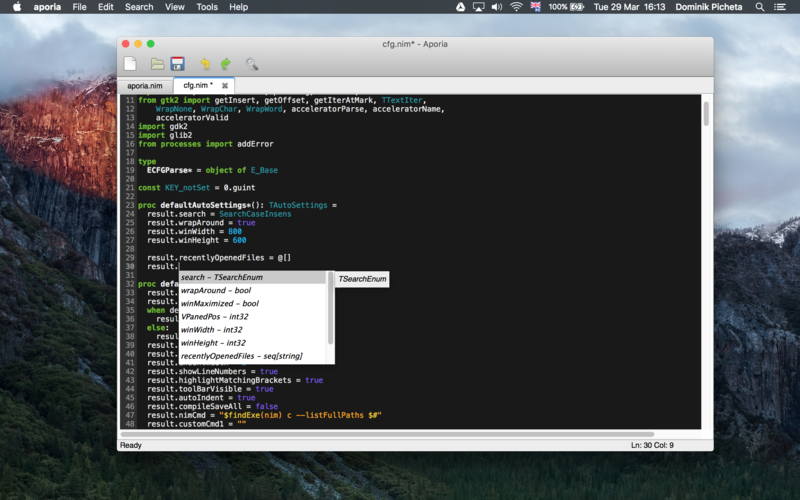 To get a nice OS X theme you will also need the GTK Quartz engine. The best one to get is from TingPing/homebrew-gnome. To use the Quartz engine you must also define the following environment variables. You can put those in your .bash_rc file or similar to make it system-wide. Note: For this to work you must have Aporia installed via Nimble. If running aporia now tells you about a missing dynamic library, dependencies might have changed and you could need to brew install another package (tell us this is broken by creating an issue and we will update the documentation).